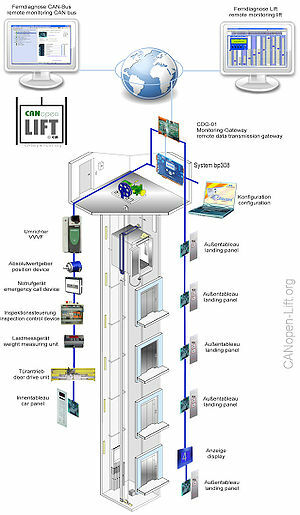 CANopen-Lift.org is an open platform of the Special Interest Group (SIG) Lift Control witch is organised at the organisation CAN in Automation (CiA) www.can-cia.org. This website is an open wiki. It serves to compare notes, information and ideas between user and supplier of CANopen products. Here we discuss questions about the application profile, technical solutions, products and applications and we will present some references with this technology. This page was last edited on 22 October 2012, at 17:04.